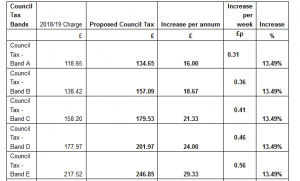 Council Tax – How many more political mouths will want feeding on Merseyside? My point is that I am very far from convinced that we need a Police and Crime Commissioner and the jury is certainly out over the Metro Mayor post because the 3rd rate devolved powers to the Merseyside Mayor make it hard to justify the cost of having one. Bizarrely, both posts are the creation of the Conservatives who used to claim they wanted to keep the rates/Council tax down! Whilst I was never a member of if it, in my time as a Borough Councillor or Council leader, my impression was that the former Police Committee made up of councillors from across Merseyside worked well and it was one of those things that was not broken and did not need fixing. But the Tories knew best and had been taken in by the American way of running Council areas with elected Mayors and Police and Crime Commissioners. Why they didn’t go the whole hog and call the P&CC’s Police Chiefs and give them a fancy uniform I don’t know. But hey you get the grand positions and then surprise, surprise they want paying, they want to hire staff and they need premises to operate from. Seems the Tories have simply added folks to the public payroll and frankly what do we have to show for our generous ‘donations’ to either cause? And before you ask, no I’m not saying that we all don’t have to chip in to run local services, it’s just that I don’t believe adding more glorified posts to the local payroll is the way to do it. So our 6 Labour Council Leaders from across Merseyside have put in their plea to George Osborne for him to give the City Region some crumbs from his devolution table. I must say I am sadly underwhelmed by their bid though. This posting is not an attempt to comment on the document page by page but I am picking out things that caught my eye, or are a particular policy interest area for me or where I think the document is deficient. We are working together!!!! – ‘We have a proven track record of being able to decide priorities locally’ and ‘We have also proven our ability to work together collectively’. No not made up it’s there in the document! Bearing in mind how our Labour Council Leaders have seemingly squabbled like ferrets in a sack for years in public via the press you wonder whether they were able to keep their faces straight when they signed a document going to Government saying they were now best mates who will stick by each other. Metro Mayor!- But moving on through this rather uninspiring document which could hardly be said to be innovative or motivating we come to a paragraph on page 3 which effectively gives the Metro Mayor game away. It says ‘We also recognise that the “prize” of devolution may necessitate a “price” to be paid in respect of the government’s stated aim of introducing an elected mayor for the City Region. We are prepared to consider making a change in our local governance arrangements……….’ Is this the Merseyside Labour Council Leaders waving the white flag and falling in behind Joe Anderson, who seems to want to rule Merseyside? Yes I believe it is and in the words of Dave Allen ‘may your God go with you’. We cost Treasury too much? 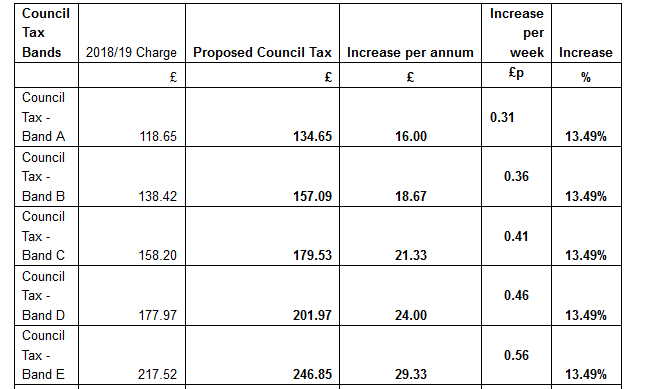 – There is an interesting and I take it to be accurate statement to the effect that the Liverpool City Region area spends two pounds on public services for every one it raises in taxation and this means the City Region has the largest relative gap between tax raised and public spending in England. £9.5 billion generated for the Treasury but £18.6bn back in public spending. A sobering thought indeed. More Cuts? – This also caught my eye ‘there are potentially efficencies and cost savings to be gained if greater control and coordination of government funding and activity is devolved to the City Region’. This could be interpreted as room for more cuts of course. 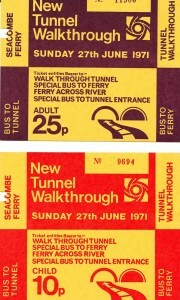 Mersey Tunnel tolls – One of the ‘Asks’ of government is that ‘Legislative clarity on the ability to utilise [Mersey] tunnel toll income for wider economic development purposes’. That should go down a bundle with residents of the Wirral in particular! This ‘ask’ seems to be linked to another ‘ask’ which requests government to pay off the loans to build the tunnels. Of course a proportion of the toll money is presently used to fund the debt repayments. I think tunnel users would want to know what their extra tax would be paying for if it was not to pay off the loans to build the tunnels. Indeed you could expect them to want lower tolls if the tunnel debts are paid off by government. 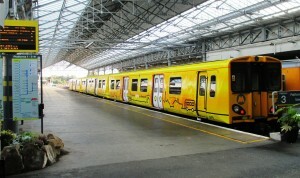 The present Merseyrail rolling stock Class 507/8 EMU’s) at Southport Station. A train ‘ask’ – There an ‘ask’ about our promised (many times) replacement rolling stock for Merseyrail to ‘reduce the financial risks’. This is linked to needing long term certainty over the Special Rail Grant that Merseyside gets each year. A reasonable request I would think here. A blast from the past a former Ribble Lydiate bound 321 bus in model form. Sadly it’s another lost route for Lydiate residents. A buses ‘ask‘ is to ‘secure the ability to franchise local bus services, to ensure that they have the required reach, penetration, quality and pricing structure and serve the needs of the Liverpool City Region’. 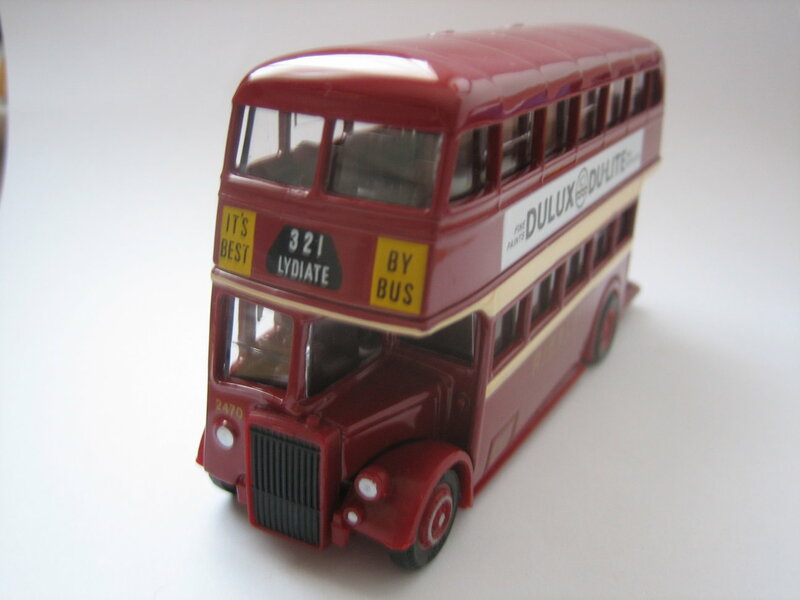 This may well, depending on what it actually means, turn the Tories Bus Deregulation Act of the early 1980’s on its head (or drive a bus through it at least) and not before time I say. BUT bearing in mind that the thrust of this submission to government acknowledges in effect that austerity is here to stay then it does not mean more subsidy for bus services unless of course that is where the tunnel tolls may be siphoned off? 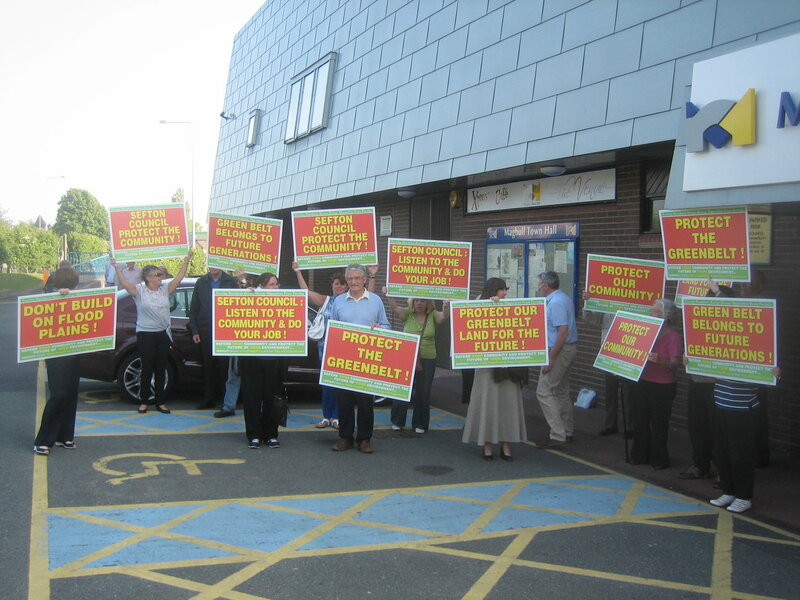 Campaigners, outside Maghull Town Hall trying to save Sefton Borough’s high grade agricultural land from development. Housing and Spacial Planning – Some very worthy stuff here but what is so obviously missing? Well as far as Sefton Borough is concerned it’s protection of its high grade agricultural land from development. So is the fact that the City Region is not making a request to government for local powers to protect it the final admission that the City Region and Sefton Council do not want to? Energy – Some good stuff here about support for the proposed offshore tidal lagoon and also a request for powers to maximise the potential of renewable energy. But even then this is hardly taking the ‘green’ agenda and running with it, surely we should be aiming to be the most energy efficient City Region in Europe? Where’s the ambition to inspire? *To consider whether an elected Liverpool City Region Mayor should take over the role of the directly elected Police and Crime Commissioner and the role of the Fire Authority. There are other ‘asks’ about Children’s Services, Education, Cultural Partnership, Health – Wellbeing and Social Care, a Free Trade Zone, European Funding, Skills & Employment and Business Support but I have not touched on those areas in this posting. My conclusion is that frankly the submission is too bland and it lacks ambition. Here was a great opportunity to lay out a radical plan to fundamentally change the health, wealth and environmental sustainability of Merseyside and it has been an opportunity lost. It strikes me, as a former Council Leader, as one of those documents written by Council Officers and then signed off/rubber stamped by politicians. Even if government gave it the green light on all the ‘asks’ I can’t see it changing the outcomes of Merseyside residents much at all. I wonder if it will get the green light from government (with a few tweaks along the way) because all the Tories really seem to want is the appearance of devolution and a Metro Mayor. If so government will say they have negotiated a fine deal to empower Merseyside and local council leaders will say they got virtually every possible concession from government and the Metro Mayor has been forced on them. But in the real world not much will change other than we all get that damn Metro Mayor idea imposed on us and another highly paid politician to lord it over us. 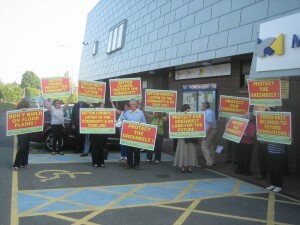 A couple of weeks ago I went to a meeting involving Merseyside’s P&CC Jane Kennedy. The meeting itself is not what this piece is about but an odd, almost throwaway remark, she made during it struck a chord with me. I can’t quote Jane directly but she said words to the effect that ‘if the PCC continue to exist’. Clearly she doubts that they will and let’s face it there have been a number a scandals involving P&CC’s across England – not involving Jane I would add. The Sunday Times recently quoted shadow home secretary Yvette Cooper saying that a future Labour government would abolish police and crime commissioners and instead give local people a say in appointing a police commander. Such a move, we are told, would save at least £50m, which could be spent on frontline policing. I am not sure what Ms Cooper means by her bland statement ‘giving local people a say in appointing a police commander’ as this could mean a number of different things but she is right to conclude that the P&CC have been a bad move. The Tories saw them as being able to make a step change in the way local policing is managed and yet many of us non-Tories just could not see how this change would deliver such an objective. Sadly, we have since seen that the Tories plan was flawed and more P&CC’s than anyone can feel comfortable with have got into trouble or scandal. What’s more virtually no one voted in the P&CC elections showing that whatever the Tories saw as a big crime and policing game changer never gained the hearts and minds of the voters. This was a wheel that did not need to be reinvented and it strikes me as one of those manifesto policies, of the needless change variety, that political parties dream up to try to show how distinctive they are from the other parties. Whosoever dream it was must have been having a bad dream!